It is a great delight to be with you today to celebrate 45 years of Ambassadorial diplomatic ties between China and Britain at this grand setting -- the historic building of Lancaster House. Forty five years are no more than a split of a second in the history of human civilization. But for China and Britain, the past 45 years have been highly significant and extraordinary. · 1984 saw the signing of the 'Sino-British Joint Declaration on the Question of Hong Kong'. · 1997 witnessed the handover of Hong Kong. o It started with 'comprehensive partnership'. o That led to a 'comprehensive strategic partnership'. o And now we are entering a "Golden Era" for all-round development. These historic, leapfrogging advances have ensured a stable and healthy China-UK relationship over decades. Most importantly our shared commitment to building the "Golden Era" charts the way forward for the long-term growth of China-UK relations. · Britain was the first major Western country to recognise and to trade with New China. o First to apply to join the Asian Infrastructure Investment Bank. o First to issue an RMB sovereign bond. o And the first to welcome Chinese nuclear investors. · On the part of China, it established comprehensive strategic partnership with Britain, the first such partnership with an EU member. · China also chose London to issue its first overseas RMB sovereign bond and its central bank bill. · And Chinese investment in the UK has, for years in a row, outnumbered that in any other European country. These fruits are vivid examples of China-UK relationship being a pacemaker in China's overall relations with the West. Our two countries have always been able to seize the opportunity in times of change, to tap into the potential in areas unexplored, and to make a success out of it with creative moves. We are able to do so because our two countries have always dared to take the lead. These 45 years have witnessed panoramic expansion of China-UK exchanges. · The annual Prime Minister's Meeting. · And the High Level People to People Dialogue. These mechanisms have paved the way for stronger exchanges and cooperation across the board. In turn, that has helped cement the foundation of the overall China-UK relations. In the international arena, China and Britain have actively fulfilled our obligations as permanent members of the Security Council and as important G20 members. Our two countries have close communication and coordination in counter-terrorism and peacekeeping, on climate change and many other regional hot spot issues. All this collaboration provides a powerful demonstration of the global and strategic partnership between our two countries. Last, but not least, these 45 years have witnessed ever-stronger popular support for China-UK friendship in both countries. In China we often say that, "Friendship built on heart-to-heart exchanges will last." This is what we believe and what we have been working hard to achieve. That friendship manifests itself through accelerating levels of exchange. Last year, Chinese and British nationals made more than 1.5 million visits to each other's country. It means there are on average 4,000 people traveling back and forth between China and Britain every day. The number of mutual visits is over 20 times larger than 45 years ago. At present, Britain is the number one destination for Chinese students in Europe. At the same time, British enthusiasm for China shows in Chinese studies. For example, there are more Confucius Institutes and Confucius Classrooms in this country than anywhere else in Europe. 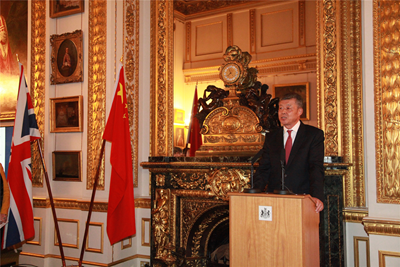 We have successfully co-hosted China-UK Year of Culture Exchange. Through that we have jointly commemorated the 400th anniversary of the passing of Tang Xianzu and William Shakespeare. These activities not only helped strengthen cultural exchanges and mutual learning but also built stronger public support for closer China-UK relations. "The past 45 years have witnessed expanding mutual interests, fruitful outcomes of win-win cooperation and closer people-to-people exchanges between China and Britain, from which the people of both countries have benefited. At present, China-UK relationship is at a new historical starting point with solid foundation for cooperation and broad prospects for further growth." "Thanks to the concerted efforts of China and Britain, the overall bilateral ties between our two countries have sustained a strong momentum of steady growth. We have maintained close high-level exchanges, deepened communication and cooperation in bilateral and international affairs, and constantly enriched our bilateral ties." Let me quote a famous line from the founding father of the People's Republic Mao Zedong. "The majestic pass and endless odyssey were clad in iron. Conquering them and beginning a new journey we carry on." Today, we are faced with a new and important opportunity for China-UK relationship. We are embarking on a new historical journey. This new journey requires us to adopt a strategic vision. We need to enhance exchanges at all levels. In turn, this can build stronger political mutual trust, match up the strengths and needs between us and facilitate win-win cooperation. This will ensure that China-UK relations advance steadily and deliver greater benefit to the people of both countries. · We need to uphold our commitment to multi-lateralism and free trade. · We need to shape an economic globalization that is open, inclusive, balanced and benefit-sharing. · And we need to join hands to promote world peace and prosperity. This new journey requires us to properly handle our disparities. We must manage our differences while building and expanding common grounds. Our experience over the past 45 years tells us that the China-UK relationship can keep growing steadily and become more mature so long as we respect each other, treat each other on an equal footing and accommodate each other's core interests and major concerns. This new journey also requires us to respond to new challenges together. A week ago, the appalling terrorist attack outside the Houses of Parliament took away innocent lives and shocked the whole world. President Xi Jinping, Premier Li Keqiang and Foreign Minister Wang Yi sent letters of condolences to The Queen, Prime Minister May and Foreign Secretary Johnson. In their letters, they strongly condemned the heinous act of terror and reaffirmed China's shared commitment with the UK to fighting against terrorism and upholding the security of our two countries and the wider world. I would like to reassure you that the Chinese people are firmly with the British people at this time of difficulties. · That marks the beginning of Brexit process. · And it starts the formal negotiation with the EU. · For China, both UK and EU are important strategic, political and business partners. · We sincerely hope that Britain and the EU will reach a win-win agreement through negotiation and will both achieve successful growth in the years ahead. · China stands ready to work with both the UK and the EU. · And China wants to ensure that China-UK ties and China-EU ties will both advance and reinforce each other. We want both these ties to work for the good of people in China, in Britain and in Europe. "A log does not make a mansion, and a river cannot fill the ocean." China-UK relations have come a long way and stood the test of time. This is the outcome and product of the wisdom and efforts of people from both our countries. I would like to take this opportunity to extend my heartfelt thanks to friends from both countries. I want to offer especially my heartfelt appreciation to everyone present here today. I want to say: Thank you for the contribution you have made to China-UK relations. I hope you will continue to care and support the development of this relationship. The steps of coming spring remind us of how time flies. It also brings a new beginning and spurs new growth. "On the great clock of time, there's but one word - Now." Seize the day, seize the hour!" "This great era enables our two countries to join hands and move forward." · Let us seize the day and seize the hour. · Let us seize every opportunity. · Let us live up to our historical mission. · Let us make the very best of Now. · And let us open-up an even more promising future for China-UK relations. 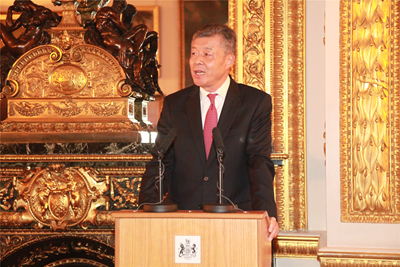 · To the 45th anniversary of China-UK Ambassadorial ties. 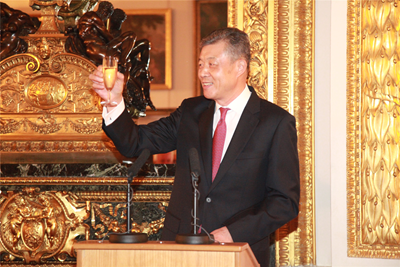 · To the "Golden Era" of China-UK relations. · And to the ever-lasting friendship between the people of China and the people of Britain.